After being on a HUGE HIGH from my 1st ever 5-figure month in April, I’m back down to reality for May. I mean, don’t get me wrong, I’m still TOTALLY grateful for the nearly $5k I made this month, but it’s nowhere near as exciting as $11k! However, I did make a pretty big shift in where the bulk of my income was coming from this month. *Please note that many of the links used below and throughout the article are affiliate links. This means that I will earn a small percentage of any sales made through those links, at no extra cost to you. Thank you for your support! $5k in earnings ($3,750 profit) just from writing?? Yes, baby! It’s still crazy to me to look back at how quickly my income sources shifted once I decided to retire my 1:1 work and focus on writing instead. 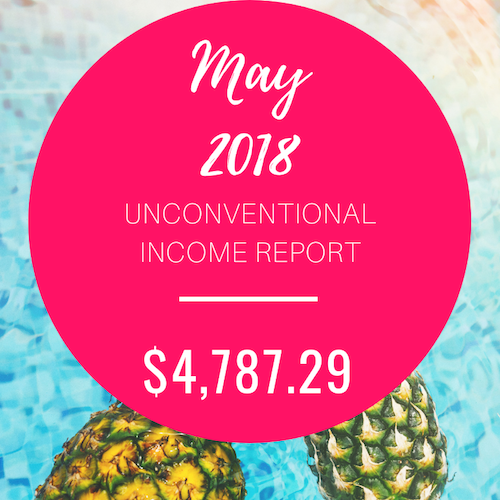 In just a few months I was able to earn MORE money while working LESS (leaving lots of time for me to focus on passion projects like The Unconventional RD Facebook Community, redesigning the FNL website, and launching a new blog on functional nutrition). Entrepreneur life is always a balance between things that earn you money NOW and things you are building for the future. For example, freelance writing takes up a few days of my week and brings in very good consistent income. But is my goal to be a full-time freelance writer forever? No, it’s not. So I have to be very careful that I don’t spend TOO much time on that “easy” income source and lose sight of the bigger picture. I see myself blogging, podcasting, running my membership site, and offering courses to help inspire RDs to think outside the box of traditional employment. I also plan to continue running the Functional Nutrition Library and Functional Nutrition Answers blog, but perhaps with a more managerial approach. In May it earned $801.53, just $11.99 more than in April. This income is earned from roughly 4 days of work per month, with pretty much no expenses besides affiliate payouts, so I’m pretty happy with that! I got 2 new annual members (woohoo!) this month, pushing the site up to 103 active paying members. Nothing else too crazy happened, just sort of chugging along, creating new content every week to improve the library! I also did a little mentoring! Another dietitian reached out to me for mentorship while she was working with a new LEAP client & I gladly accepted! It’s weird how I actually enjoy mentoring much more than working with nutrition clients. Some days I’m sooooo tempted to add some mentoring hours to my schedule, but I have to remind myself that I really can’t fit anything else on my plate right now. Something would have to give. And it would probably be freelance writing. I just can’t decide if that would be a smart trade or not! So conflicted! BUT, I am launching The Unconventional RD Business Bootcamp in less than a month (yay!) and I think that might scratch my mentoring itch. Soooo… If you’re looking for the opportunity to be mentored by me (in a group setting) at a very low cost, check out The Unconventional RD Business Bootcamp, launching in January 2019! Affiliate income was not too shabby this month. I earned ~$50 from recommending the membership site Food Blogger Pro, which is my favorite place for food bloggers to go to learn the business. It’s a membership site (you can pay annually or monthly) that contains training videos and a forum where you can interact with other people who are trying to build a business out of their food blog. I was actually a member of Food Blogger Pro back when I was trying to build a food blog. It was a really helpful resource and I still recommend it to this day! Since I hired research assistants last month, my expenses have increased a lot. BUT, I’m also earning more, so it balances out. It’s a little bit weird to get used to spending more money to make more money, but I honestly think it’s one of the big milestones of entrepreneurship. At some point, you’ll hit this tipping point where you’re actually profitable (yahoo!) but start to realize that your TIME is the limiting factor. Once you get to that point, it’s the perfect moment to hire out. Ideally, you can hire people to work on tasks that are helpful to the business but perhaps not directly revenue generating, or for things that are outside of your wheelhouse/zone of genius. That way you can focus your time on the things that ONLY you can do for your brand or business (be that podcasting, seeing clients, filming videos, recording courses, or whatever). So far I’ve only hired assistants to help speed up my writing process, but would love to hire some social media help in the future! This month I also signed up for Natural Medicine’s Comprehensive Database. If you’re not familiar with it, NMCD is a membership site with research overviews on a wide variety of supplements, herbs, and nutraceuticals. Since I write a lot of articles on “The Health Benefits of XYZ Food or Supplement” I thought it was a worthy investment to make sure I covered all the main points in those articles. I used to get access to the database for free when I was a member of the AND’s Dietitians in Integrative and Functional Medicine practice group, but since I didn’t renew my membership this year I decided to purchase a subscription myself. *PS you can also get free access to the database if you’re a member of IFNA (Integrative and Functional Nutrition Academy)! Other than that, all my expenses were pretty typical this month. ConvertKit as my email service provider, Thinkific for my online courses, Tailwind to automate my Pinterest posts, Zoom to record a group meeting, and regular hosting, storage, banking, and insurance fees. The biggest thing that took up extra time was the GDPR debacle. In case you missed it, basically, a whole bunch of strict privacy laws went into effect in the EU that affected businesses worldwide. Basically, anyone with a website that collects information from people (including email addresses and non-personal information, like what gets collected by Google Analytics) has to follow the new GDPR rules for any EU website visitors. 2) SEGMENTED MY EMAIL LIST to figure out who I had on my list from the EU (your email provider should be able to do this). 3) SENT THOSE PEOPLE AN EMAIL to click a link to re-confirm that they wanted to stay on my list. (Your email provider should have specific instructions on how to do this). 4) DELETED any EU subscribers that didn’t click the confirmation link by Thursday night (the 24th) – since it was illegal to process their data without their explicit permission from the 25th onwards. 5) UPDATED MY OPT-IN FORMS on my website so that people from the EU were NOT automatically added to my email list without their permission. Basically, the new GDPR rules say that if you want to offer a freebie download to get someone to join your list, you cannot automatically add people from the EU to your newsletter without their permission. They MUST indicate that they want to receive the newsletter first (usually through an additional checkbox on the opt-in form). If they don’t check the box, you still have to send them the freebie without adding them to your list. Honestly, email marketers went berserk over this new rule and it was all super confusing. Thankfully, a lot of email service providers (including ConvertKit) added GDPR compliant check-boxes that would only display to people accessing your site from the EU. For many American businesses, EU visitors only make up a small portion of their customer base, so while these changes sucked and maybe led to a small loss in email subscribers or new customers, it wasn’t earth-shattering. It was all the rewriting, resegmenting, and redoing opt-in forms that was the most annoying! If you missed all these updates, it’s not too late to get compliant! I would get to it ASAP since technically the penalties for not complying with GDPR are steep ($10 million dollars!!!!). Other than that, May was business as usual! 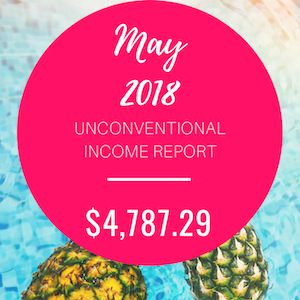 I hope you enjoyed this month’s income report, and I look forward to publishing June soon!